The success story of Symalit begins in the 1950's when polyamide was first discovered as a replacement material for metal and the world production of plastics has not yet reached ten million tons. The company was founded in 1952 in Killwangen in the Swiss Canton Aargau and began the production of plastic cable protection conduits. Today it is part of the Mitsubishi Chemical Advanced Materials Group and seated in Lenzburg. In the following years, Symalit as a pioneer in using this still new material, develops the first cable protection conduits made of the environmentally friendly plastic polyethylene (PE). 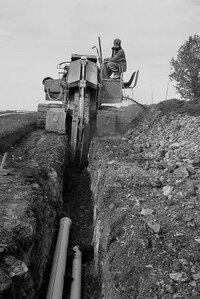 Already in 1956, the company launches the first cable protection conduits made of PE. In 1973, Symalit expands its commitment to plastics and successfully begins the development and production of fluorine plastics. Five years later follows yet another diversification: The company begins with the development and production of fibre-glass reinforced composite material (GMT). In 1988, Shell (Switzerland) AG takes over Symalit AG and continues to manage the company as an independent corporation, maintaining its range of products and intense commitment to research and development. The Swiss experts in plastics are globally present and supply leading industries with their products when the Quadrant Group takes over Symalit in 1996. Symalit supplies fluorine plastics to the semi-conductor industry, produces Glass Mat Thermoplastics (GMT) for the automotive industry and supplies the construction industry with cable protection conduits. 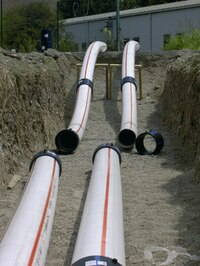 In 2001 Symalit acquires the cable-protection-conduit business of Jansen AG. Within a mere year, this is followed by the cable-protection-conduit business of Wavin Swisspipe. At the same time, the composite-material business (GMT) is separated and continued as an independent division under the name Quadrant Plastic Composites. The fluorine plastics as successively separated from the main corporation and integrated into the Engineering Plastic Products division acquired from the Dutch company DSM N.V. Since then, MCAM Symalit AG again is focussed on its original business and today is a Swiss market leader in the supply of cable-protection-conduits solutions. In addition to an exceptionally broad product line, Symalit offers comprehensive consultation and technical support. A product-based and tailor-made solution is developed for each scenario – down to the production of non-standardized moulded parts.